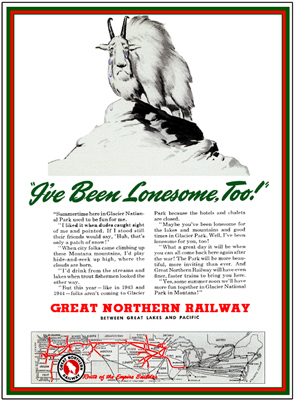 Great Northern Railway was chartered in 1889 by James J. Hill, The Empire Builder. 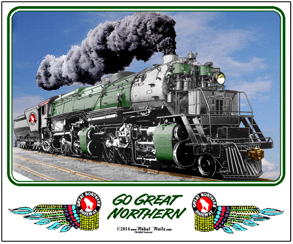 You go great when you go Great Northern. Rocky the Mountain Goat was their mascot. Individual marks are licensed marks owned by BNSF Railway Company and are used under an active license agreement. 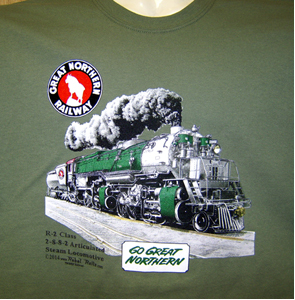 Military Green tee featuring Great Northern Railroads largest steam locomotive, 2-8-8-2 Articulated R-2 Class, at nearly 530 tons. Crews referred to these monsters as mountain shrinkers. So authentic you just might feel a rumble in your shirt. The Great Northern Railroads beautiful LOGO t-shirt. A beautiful Christmas scene on the Great Northern Railway. Nostalgia at its best. A beautiful moonlit dusk Christmas scene of the Empire Builder rounding a gorgous western snow covered Christmas Tree. 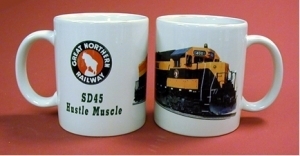 Great Northern Railroads Hustle Muscle diesel decorates this beautiful and colorful coffee mug. 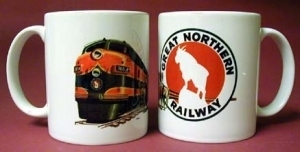 Coffee Mug featuring the Great Northern Railroads logo superimposed over the paint scheme of its diesel locomotives. A very unique way to present the railroads logo. 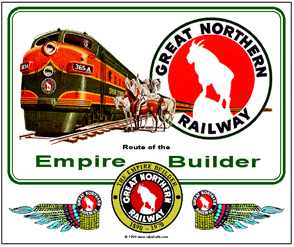 Great Northern Railroads beautiful Empire Builder passenger train meeting North Plains Indians. 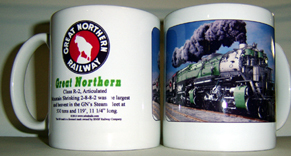 Coffee Mug featuring the Great Northern Railroads largest steam locomotive, the 2-8-8-2 Articulated R-2 Class, at nearly 530 tons. 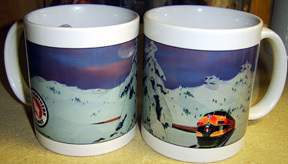 Crews referred to these monsters as mountain shrinkers. 6 inch x 6 inch square tin America First logo sign used by the Great Northern Railway. 6 inch x 6 inch square tin Blue Rocky logo sign of the Great Northern Railway. 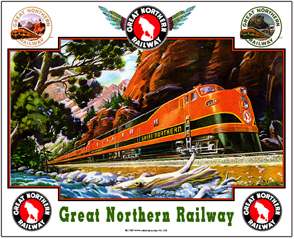 6 inch x 6 inch square tin Glacier National Park round logo sign as used by the GN Railway. 6 inch x 6 inch square tin classic Rocky logo sign of the Great Northern Railway. 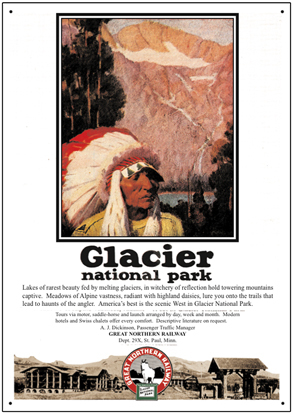 6 inch x 6 inch square tin Glacier National Park rectangle logo sign as used by the GN Railway. The Great Northern Railroads largest and most powerful locomotives were these homebuilt 2-8-8-2 articulated monsters. They were the worlds largest locomotives when built in 1927-28. A paused Great Northern Railroad passenger train is being admired by local Indians. Sign features a beautiful scene of an A-B-B-A set of FT diesls powering a Great Northern freight train passing Black Tale Mountain in the American Northwest. 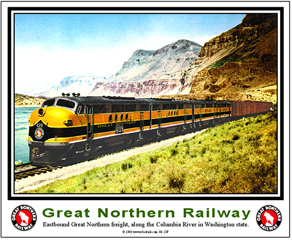 The Great Northern Railroads fast and beautiful Empire Builder transcontinental passenger train rolling by a mountin stream in the American Northwest. 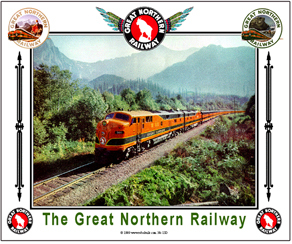 The fast and famous transcontinental Empire Builder of the Great Northern Railway rolls through the mountains of the American Northwest. 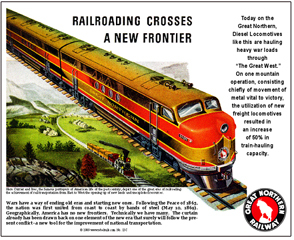 An EMC advertisement showing the Great Northern Railways new FT diesels have arrived on the property and are in freight service. An A-B-B-A set of EMC FT diesels powers this long freight along the Columbia River in Washington State on the Great Northern Railway. 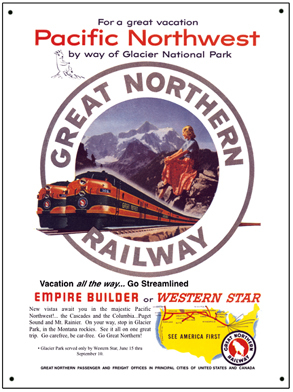 Colorful reproduction of an advertisement ran by the Great Northern Railroad promoting its scenic lines to Glacier National Park. Lonesome Rocky the mountain goat. He's been lonesome throughout the World War II and can't wait for tourist to start traveling out west. We might still be fighting WWII if it wasn't for America's Railroads and Auto Industry. 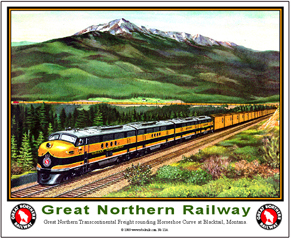 Colorful advertisement ran by the Great Northern Railroad just after World War II, promoting its scenic lines through the beautiful Northwest. 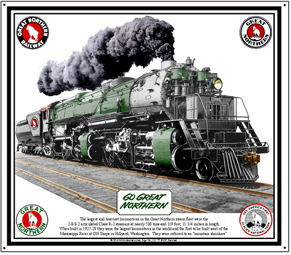 Tin sign of the Great Northern Railroad largest steam locomotive in its fleet. The massive 2-8-8-2 articulated steamer was the largest in the world when it was homebuilt in 1927-28.